Tampa Bay Buccnaeers head coach Tony Dungy of waves to the crowd during a game against the Detroit Lions on Dec. 28, 1997, at Houlihan's Stadium in Tampa, Florida. The Buccaneers won the game 20-10. Tony Dungy and Jon Gruden are the only two coaches in team history to leave the team with winning records. The Tampa Bay Buccaneers head coaching search could come to an end as early as this week. and Dallas Cowboys defensive assistant coach Kris Richard. Notable accomplishments: The Buccaneers won two NFC Central division in 1979 and 1981. The Buccaneers made three playoff berths in 1979, 1981 and 1982, compiling a 1-3 postseason record. McKay was known for his sense of humor during news conferences. In June 2001, McKay died of kidney failure arising from diabetes at a hospital in Tampa. He was 77.
Notable accomplishments: Won two out of three games in November during the 1985 regular season. The Buccaneers went 2-14 in each of Bennett’s two seasons as head coach. Bennett is retired after purchasing and selling a car dealership. He also is a chairman of the selection committee for the Peach Bowl. Notable accomplishments: Perkins never won more than five games in his four seasons coaching the Bucs. Perkins was fired midway through the 1990 season. Most recently, Perkins served as the head football coach from 2011-2013 at Jones County Junior College in Ellisville, Mississippi. Notable accomplishments: Williamson worked under Perkins as an offensive coordinator. When Perkins was fired in the 1990 season, Williamson was named as the interim coach. He went 1-2. The next year he went 3-13 before he was fired at the end of the season. In September 2015, Williamson died after battling at heart condition. He was 74.
Notable accomplishments: Wyche never compiled a winning record in his four seasons as Buccaneers head coach. However, the team drafted several All Pro players during his tenure, including linebacker Derrick Brooks, Warren Sapp and John Lynch. Wyche is the current coach at Pickens High School in South Carolina. Notable accomplishments: The Buccaneers won the NFC Central division in 1999. 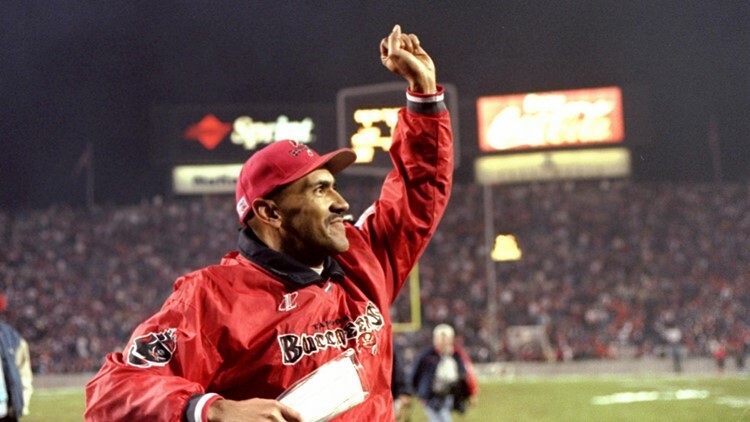 The team made four playoff berths during Dungy’s tenure in 1997, 1999, 2000 and 2001. The Buccaneers lost to the St. Louis Rams in the NFC Championship game in the 1999-2000 season. In January 2002, Dungy was fired for the team’s repeated losses in the playoffs. Dungy was inducted into the Pro Football Hall of Fame in 2016. He was also inducted into the Buccaneers’ Ring of Honor this past season. Dungy won Super Bowl XLI as head coach of the Indianapolis Colts. During his tenure in Tampa, Dungy installed his version of the Cover 2 defense with defensive coordinator Monte Kiffin with a few new wrinkles. They called it the Tampa 2. Dungy is now an analyst for “Football Night in America” on NBC. Notable accomplishments: Gruden replaced Dungy as head coach in 2002 in a trade with the Oakland Raiders. After Bill Parcells turned Tampa Bay down, Gruden signed a five-year, $17.5 million contract. The Raiders received a first- and second-round draft choices in 2002, a first-round choice in 2003 and a second-round choice in 2004. The deal also sent $8 million in cash payable over three years to the Raiders. Gruden won Super Bowl XXVII in the 2002-2003 season in his first year with the Buccaneers, defeating the Raiders of all teams. At the time, Gruden was the youngest head coach to win a Super Bowl. The Buccaneers made two more playoff appearances during Gruden’s tenure in 2005 and 2007. The team lost in the Wild Card round of the playoffs both times. The Bus fired Gruden in January 2009 after the team finished the season with four consecutive losses. Gruden and Dungy are the only two Bucs coaches to leave with a winning record. In December 2017, the Buccaneers inducted Gruden into the team’s Ring of Honor. Before returning to coaching the Raiders in 2018, Gruden served as an analyst for ESPN and Monday Night Football. Gruden has the most wins in Buccaneers franchise history. Notable accomplishments: In December 2008, the team announced Morris would take over as defensive coordinator Monte Kiffin, who was leaving to join his son, Lake Kiffin, at the University of Tennessee. A month later, the Buccaneers fired Gruden and named Morris as the team’s head coach. The Buccaneers compiled a 10-6 record during the 2010 regular season, but the team failed to make the playoffs. The seven-game turnaround (the team went 3-13 in 2009) is the best in franchise history. In 2011, the Buccaneers went 4-12 and lost their last 10 games. Morris was fired at the end of the season. He is currently an assistant head coach and receivers coach for the Atlanta Falcons. Notable accomplishments: In Schiano’s first head coaching opportunity, the Buccaneers went 7-9 in 2012 and 4-12 in 2013. The Buccaneers fired Schiano in December 2013 along with general manager Mark Dominik. Schiano now serves as the defensive coordinator at Ohio State. Notable accomplishments: The Buccaneers went 2-14 in Smith’s first season and 6-10 in 2015. Smith coached quarterback Jameis Winston for one season. Koetter never fared better than the 9-7 record he compiled in the 2016 season. After a consecutive 5-11 seasons, the Buccaneers fired him. The Buccaneers were featured on HBO’s “Hard Knocks” during training camp in 2017. Editor's Note: Pro Football Reference was used to compile the team records used in this story.